Born in Michigan City, IN and raised in Alabama, Matt Miller is a Southern boy who fell in love with the West. After graduating from the University of South Alabama in 1992 with a BS in Business Administration & Recreational Resource Management, Miller headed to Vail, Colorado. His adventurous spirit landed him a number of unique jobs—a snowmobile guide, a bar tender, a ski lift operator, a gas station attendant in Yellowstone National Park, an ATV guide, and a pizza cook. However, it wasn’t until Miller joined Manchester Farms that he received his official title as the “Vice President of Fun”. In 1998, Miller met and married his wife, Brittney Odom. The couple stayed in Vail for six years before moving back to Brittney’s hometown of Columbia, SC to take over the family business – Manchester Farms. Now serving as Purchasing Director for the farm, Miller likes to tease that he found his career by “marrying the farmer’s daughter.” In his role, Miller oversees sales, marketing, purchasing, and inventory. Coming up on his ninth year at Manchester Farms, Miller has grown to love the people associated with the family business and the stories they tell. 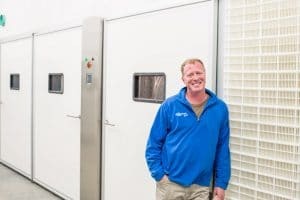 Whether he is talking to a chef about a new recipe or listening to a friend’s memory of frying quail with their mother, Miller has fully embraced the South Carolina quail farm life. Miller’s success mentality is defined by striving to love what he does so that his job seems more like life than work – and he feels he has certainly succeeded. When Miller isn’t on call as the “Vice President of Fun” for the company, the family man keeps his same title at home. Miller can be found spending time with Brittney and their two children. In the summer, the family of four likes to hang out on the lake, and in the colder seasons, they venture to the woods for some hunting and four-wheeling.